NFC tags, QR codes and augmented reality technology have been included in 40 wooden way signs at nine sites along the South Downs Way, a 100-mile walking route through the South Downs National Park, an area of unspoilt countryside in the south of England. The new way signs allow walkers to “tap in” to the signs via NFC or scanning a QR code to discover more information about the local area and nearby places of interest. Details that visitors can uncover include map references, links to YouTube videos, photos, local history, audio commentary and information about the wildlife that lives nearby. Pictures at the top of each sign can also be used to trigger the Layar augmented reality app. When the picture is scanned, several floating image buttons appear on the smartphone’s screen. People can then press each of the touchscreen buttons to instantly link to web, audio, video, pictures, map trails and other content at each location. 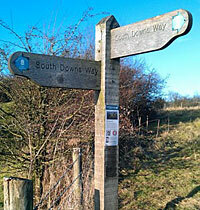 MULTIMEDIA: One of the NFC signs used on the South Downs Way. Click to enlarge. “There are fascinating landscapes across the National Park where it’s just not appropriate to put up large display panels,” says Andy Gattiker, trail officer for the South Downs Way. “By ‘tapping in’ to these small signs smartphone users will be able to discover all sorts of information about the land they’re walking through. The hi-tech way signs have been developed by ITiC, a specialist in the effective use of mobile and internet technologies in the heritage sector. The NFC tags have been supplied by London-based RapidNFC. Great initiative, though if these signs are located in low bandwidth areas (non-3G), avoid using tinyurl schemes and 3rd party tools to access them ‐ people aren’t going to like waiting while their phones get redirected a few times.